Neither of you are from Mount Barker so what made you buy here? A: We were originally looking for somewhere between Mannum and Adelaide. I grew up in Adelaide and that’s where my family is, and Simon grew up in Mannum so that’s where his family is. S: It was a compromise. A: It was. We wanted somewhere in the Hills, we like the semi rural lifestyle so we’ve got the best of both worlds here. We were originally looking in Woodside, Stirling or Aldgate but then we decided on Mount Barker, and we’re still so close to the other great spots in the Adelaide Hills. You both work in Mount Barker now, did you work here before you moved here? S: When we bought the block I was still working in Mannum but we were looking to start a new life. 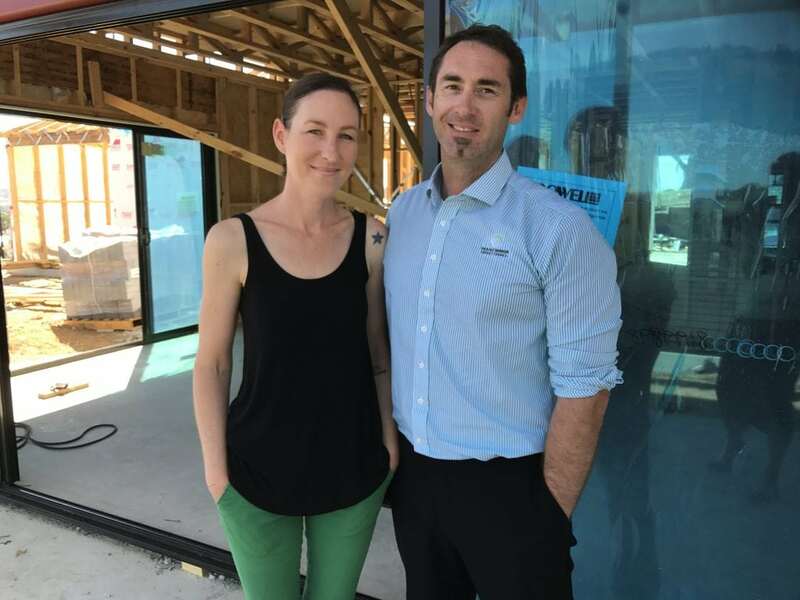 A: We stumbled across Aston Hills completely by accident, then we bought the block and an opportunity for Simon to work here in Mount Barker came up. It was a really good opportunity, then I happened to fluke a job here as well so we moved here sooner than planned. We are renting just down the road now, which is fantastic as we walk the dog every night and check on the progress of the house! Now that you’re living here, what do you love most about Mount Barker? S: The weather, it’s a lot cooler up here. A: We’re still so close to Adelaide and to go up to the river. The community’s been really amazing, they’ve really welcomed us. I’ve made lots of new friends very quickly which can be hard to do in other places. And we’re enjoying the semi rural lifestyle, we take the dog for a walk every night. We’re all a lot more active here. S: We’ve got all the walking trails and the wetlands five minutes down the road. A: Our daughter rides her bike everywhere. Since moving, my mental wellbeing has been better, I’m just happier. It’s energising, it offers a better quality of life. And we’re close to everything… we’re 40 minutes from the beach and 20 minutes to the city! How did you decide on Aston Hills? A: We went for a drive through some other developments and visited the display homes and then we found out there were display homes here. We drove around the streets of Aston Hills and just thought – wow, this is amazing. We started talking to the agents and found that this was going to be a community, not just a housing estate or a development, and that cinched it for us. S: We were new to the area and didn’t know the town that well so we kept driving and looking around and when we found this place we just loved it. A: The fitness trails, the bike trails, the wetlands a short drive away, it just made sense here. It’s tucked away, it’s not right in the heart of Mount Barker so it still has that rural vibe to it, we’re surrounded by paddocks and we go looking for kangaroos every night. To quote The Castle ‘it’s just the vibe of it’! What are you looking forward to most about moving here? A: Just seeing our house finished, all of our choices come together, all of our hard work and being able to enjoy our own space and connect as a family – finally be settled. S: I’m looking forward to seeing it all finished, all the gardens and everything done. A: I’m looking forward to the walking trails, the lifestyle, still being close to everything and the community spirit and getting to know people here, hopefully there will be a lot of other families with children. Hopefully we can get together on a Sunday for a Weber old school style. A: I feel like it’s the start of a new life here for us. We’re just excited, we just love it here, and we’ve really built our home from the heart.